Kevin Smith's horror thriller Red State signalled a real change in direction for a film maker mostly known for unbelievably crude humour and always casting a pre-career renaissance Ben Affleck in the lead role. While it may be overshadowed by Smith's 2011 Sundance rant where he shone a light on the modern film distribution model, it is a surprising movie that, while not perfect, is still pretty brave and refreshingly crazy. But it could have been a whole lot crazier. 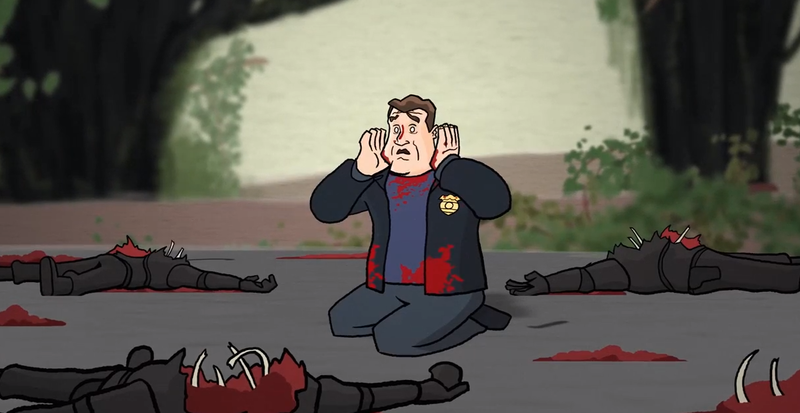 Working with Entertainment Weekly, Smith has revealed the original ending for Red State, handily presented in animated form. Cut due to budget constrictions (the movie cost $4 million, and the ending would have needed at least $15 million), it's an absolutely massive and ballsy scene that, as well of needing tons of effects shots to pull off, would have sent the movie off in a completely different direction. It's not a complete tonal shift in terms of the characters the movie was dealing with, but it is definitely a big change of pace , maybe to big for audience to swallow. Personally, I love the original ending the rug it pulled out from under us with that scene change, but what do you think? Is this a better ending? Sound off below with your thoughts.